How good has the Texans franchise been over the last decade? The team has five playoff appearances, but hasn’t made it past the Divisional Round. The team has seven winning records, but also 2-14 and 4-12 seasons. The team has five division titles, but also two last-place finishes. Of those seven winning records, four were only 9-7, but then a winning record is a winning record. Add it all up, and you’d probably call the Texans the very best mediocre team of all time. A big chunk of the league’s franchises would happily trade decades with the Texans, but there are plenty that the Texans would happily trade with as well. Let’s take a look at the best Texans fantasy seasons of the last decade. 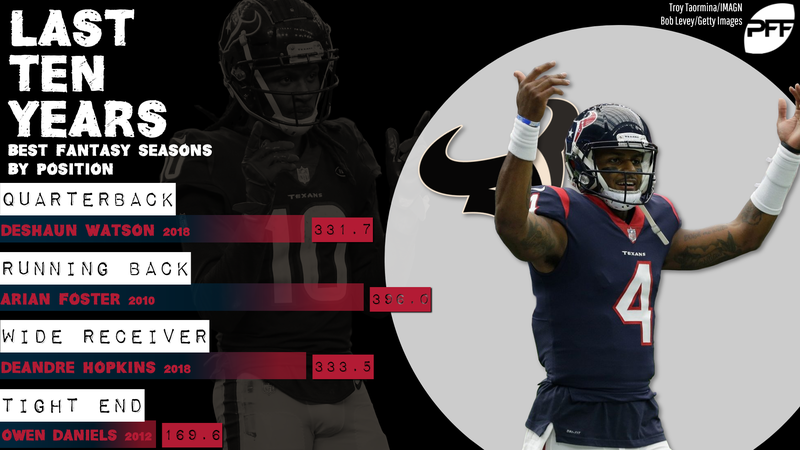 Watson’s 2017 season probably would have stood atop this list if he hadn’t torn his ACL in the middle of the season; he averaged 25 fantasy points per game that year compared to “only” 20.7 in 2018. But even with that, Watson’s 2018 is the best Texans fantasy QB season over the last decade by nearly 50 points over second place (Matt Schaub’s 2009) and 80 over third (Schaub’s 2010). The team hasn’t been a quarterback powerhouse over the last 10 years, but Watson’s presence could be changing that. Foster’s 2010 season was the third-best RB fantasy season over the last decade (behind David Johnson’s 2016 and Chris Johnson’s 2009) and the best RB season of 2010 by almost 100 full points (Peyton Hillis had 307.0 points). It was Foster’s first full season (after a six-game rookie 2009) and pretty clearly his best, featuring career-highs in rushing yards, touchdowns, yards per carry (4.9), and targets (78). His 2010-2014 stretch featured 21.1 fantasy points per game, more than two points better than any other back in the league. His career didn’t last a long time, but it was insane while it did. The race for last year’s No. 1 fantasy receiver was a close one. Entering Week 17, Davante Adams, Antonio Brown, and Michael Thomas were first through third, but neither Adams nor Brown played in the season finale, while Thomas barely did. That opened the door for Hopkins, Julio Jones, and Tyreek Hill to claim the top three spots, with only 18 points separated WR1 from WR6 on the season. For the Texans’ decade, Hopkins and Andre Johnson hold down all of the top-10 slots, evenly split between the two, but Hopkins’ 2018 and 2015 are the top two on the list. Daniels was the sort of tight end you settled for in fantasy. You missed out on Antonio Gates or Rob Gronkowski and didn’t feel like drafting the third or fourth tight end in ADP, so you just waited and took Daniels later and it worked out fine. Not great, not season-making, but good enough that you weren’t sad about it. He topped 100 fantasy points eight different times in his 10 seasons but never had a monster season. He was fine. And that’s a high compliment.